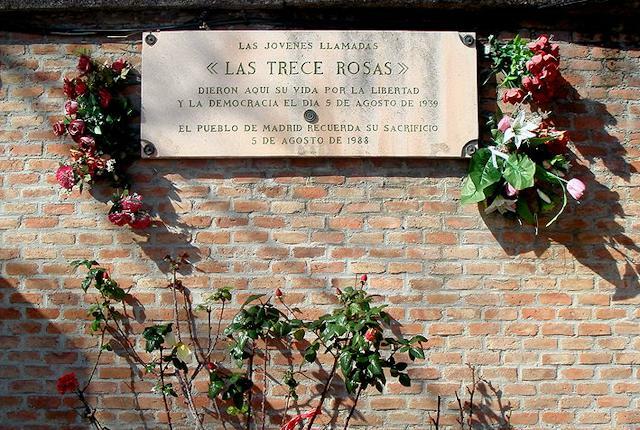 'Las Trece Rosas' - the Thirteen Roses - is the name given in Spain to a group of thirteen young women who were executed by a Francoist firing squad just after the conclusion of the Spanish Civil War. Their execution was part of a massive Execution Campaign against AntiFascists, known as the "Saca De Agosto", which also included 43 young men, among them a fourteen-year-old. Their crime ? They were Socialists, and Anti Fascists. During their detention in the Ventas prison they were repeatedly tortured and humiliated, and conditions in the prison were considered inhumane and overcrowded. They were ultimately executed by firing squad against the wall of the East Cemetery (now la Almudena) on 5 August 1939. While they were being driven away by lorry to their deaths, they sang the Spanish Socialist anthem, "Youthful Guardsmen".